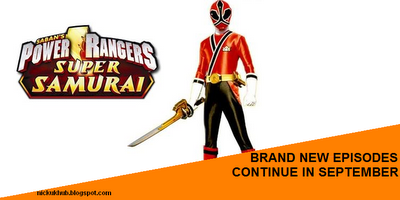 NickUKHub: Nickelodeon UK Announce Plans To Continue New Episodes of Power Rangers Super Samurai in September 2012! Nickelodeon UK Announce Plans To Continue New Episodes of Power Rangers Super Samurai in September 2012! According to the blog NickALive!, Nickelodeon UK & Ireland will continue to show brand new episodes of the second part of the Power Rangers Samurai, titled Power Rangers Super Samurai, as part of September 2012 on Nick UK & Ireland. A new episode of Power Rangers Super Samurai will be shown on August 12th 2012 at 8:30am, part of a morning of premieres on Nick UK & Ireland.